Activism consists of efforts to promote, impede, or direct social, political, economic, or environmental change. Young women have more choices to make today about what to be. One of those choices is activist. Activism, suffers injury when it is considered as merely practice and effect, for in fact it has also to carry forward not only the external but also the internal situation of things. On the other hand, mental creativeness must be looked upon as something more than a mere preparatory stage for activism it has ever to present us with norms superior to the transient aspects and impressions of the world and of the moment, and it has to deal with the orientation of our quests. Without penetrating Criticism, Creativeness fails to stand out in bold relief from the ordinary shallow life, and fails in self-reliance as well. But unless we pass from both into Activism the necessary clarification is lacking, and effects which are possible come to nought. Therefore the different tasks serve one specific total-task. Pragmatism and activism attach very different meanings to the union of truth with life. The former regards truth as merely the means towards a higher end (which seems to us subversive of inner life), while the latter makes it an essential and integral portion of life itself, and hence can never consent to it becoming a mere means. My point is not that everything is bad, but that everything is danger­ous, which is not exactly the same as bad. If everything is dangerous, then we always have something to do. So my position leads not to apa­thy but to a hyper- and pessimistic activism. I think that the ethico-political choice we have to make every day is to determine which is the main danger. To be naïve, especially politically, would mean seeing reality as simple and clear-cut once again. It would imply viewing the social world in an unambiguous and probably dualistic way with, for example, the ruling class and exploiters on one side, and the ruled and exploited on the other with no distinctions in between. Likewise it would mean conceiving of the world as eminently changeable and subject to human will, not as something given over to the play of accident or chance. Historically speaking, the naive attitude has engendered tremendous passion and commitment to the same degree that the ironic attitude has produced skepticism and passivity. Most mass movements of both the Left and Right have been naive in the sense described here. In fact it could be argued that activism is possible only where there is the real (though "naive") conviction that the world is completely mutable and therefore capable of being shaped by human action. Furthermore, the naive awareness does not allow itself to be paralyzed by obstacles, but rather engenders in its adherents a feeling of dedication and vision, of vigor and enthusiasm, just as early Christianity did (and the Church of the first three centuries was a model "naive movement"). Such movements acquire faith in themselves, and consequently great power, precisely because they see reality in unequivocal terms. Lastly, the naive outlook generates an inordinate capacity for heroism and heroic commitment which cannot be aroused by the ironic mode. What if 100m or more people marched around the world in protest at what it is we now see: the ineptitude, selfishness, the cruelties and the threats to our collective well-being? ...This has never been done before; but if we did do it, it might just deliver a sort of shock therapy to those dangerous or useless politicians who now threaten humanity. The most powerful thing young students with neither money nor power can do, is to do activism and use journalists and their cameras. When people learn about the problems and discuss them, things start to change. I often talk to people who say, ‘No, we have to be hopeful and to inspire each other, and we can’t tell [people] too many negative things’ . . . But, no — we have to tell it like it is. Because if there are no positive things to tell, then what should we do, should we spread false hope? We can’t do that, we have to tell the truth. Unite behind the science, that is our demand. (Thunberg told a plenary session of the European Economic and Social Committee (EESC). 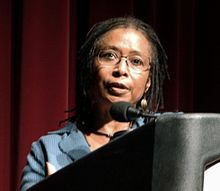 Alice Walker, from the film poster for Alice Walker: Beauty in Truth.